I'm going to try to do a weekend book review every few weeks. These books will mostly be about growth and development in children. Books that I have found to be extremely useful! I'd like to do one every weekend, but I'm not sure that I can read one every week... my commute on the TTC allows me to read one book a week, and I like to read fiction too! Po Bronson and Ashley Merryman wrote this book to address the most important traits that they feel that children should have: gratitude, honesty, empathy, and fairness. I found this book to be an exciting and interesting journey. It changed my thinking about how children acquire knowledge... and why they do some of the things that we would rather not see them do. 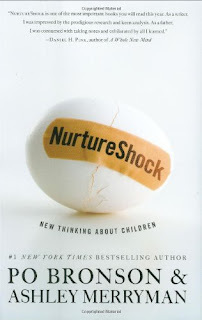 I believe that it is a must-read for parents and teachers of babies, toddlers and adolescents. It's never too late to learn about how and why our children behave the way they do. It is a bit heavy on studies and statistics, but they really just support the real -life examples that are presented. 1. The Inverse Power of Praise - Why telling our children that they are working hard (effort) is better for self esteem than telling them that they are doing well (achievement). 2. The Lost Hour - How sleep deprivation is costing our children too much. Get those kids to bed! 3. Why White Parents Don't Talk About Race -Why do cross-racial friendships decrease in schools that are more integrated? 4. Why Kids Lie - Why do 98% of kids lie? We need to praise honesty, and not praise little white lies. But a child's dishonesty is actually a sign of intelligence and social savvy. 5. The Search for Intelligent Life in Kindergarten - Is intelligence testing in preschool or Kindergarten a good indicator of future success? 6. The Sibling Effect - Why are so many kids aggressive? 7. The Science of Teen Rebellion - Teen see arguing a sign of respect. 8. Can Self-Control be Taught? - Being disciplined is more important than being smart. Learning to plan and think proactively is the key. 9. Plays Well With Others - Let your children see you argue, but please make sure that they see you resolve your differences! 10. Why Hannah Talks and Alyssa Doesn't - Acquisition of language skills -- what to do. I'd like to read more about the importance of gratitude in our lives.
" ... children will not experience gratitude unless they recognize three things about the various bounties in their lives: that they are intentional, costly, and beneficial. Children need to comprehend that this nice life of theirs isn't by accident, it's a gift of hardworking parents and teachers who make sacrifices for the good of children - who in turn truly benefit from it." But, when studied (Froh, the researcher found) "that his intervention led those children to realize just how much of their lives depended on someone else's whim or sacrifice. They didn't feel happy that people were always there doing things for them. Instead it made them feel powerless"
Above all, we have to remember that a "One size fits all" model doesn't work. Take this book out from the library, or buy yourself a copy. It's well worth it. What is a loom ?